The Illustration Friday word of the week is artificial. We’ve all felt it… that subtle, disappointing sense of having been slipped plastic grapes in place of the real, juicy thing—genuine connection with another human. A sense of being treated like an object, an audience, or a source of supply… and it’s exactly the same feeling (if we are paying attention) when we, ourselves interact with another person this way. It registers somewhere deep inside the solar plexus as a loss… and it feels awful. And yet, this way of being ‘social’ has come to be normal. It is the rare person who will give an honest answer to the question, “How are you?” It is an even rarer person who will welcome a brief glimpse into another human’s life without recoiling. Polite society has become a cold place, and we all suffer to some degree from a sense of alienation… “Making Nice” has become habitual. The American poet, e.e. cummings (1894-1962) wrote, “To be nobody but yourself in a world which is doing its best, night and day, to make you everybody else means to fight the hardest battle which any human being can fight; and never stop fighting.” In this age of fast food, text messages and appointment notebooks, such a statement is more true than ever. Did you know that if a body is in a state of nutritional deficiency, it will reject all but the barest minimum of an artificial vitamin or supplement… but fully absorb that same substance if it is supplied in its natural state from fruit or vegetable? It is the same with human relationships. Many of us are walking around severely malnourished for want of genuine, human connection. 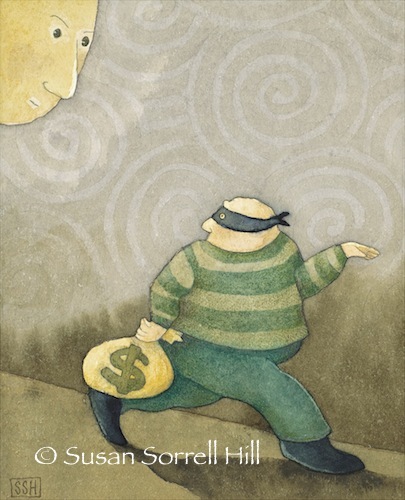 Perhaps a Soul malnutrition is the real source of the epidemic of obesity and substance abuse? What is the solution? Mahatma Gandhi (1869-1948) said it best: “You must be the change you wish to see in the world.” Let us be brave today. Let us take our masks off … and shall we lay down those shields, while we’re at it? 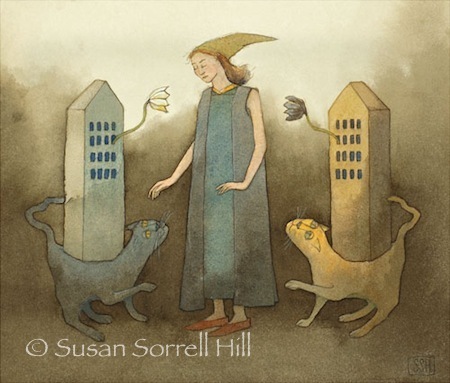 I have become a great admirer of the Seven Impossible Things Before Breakfast blog, and especially of their artist interviews. 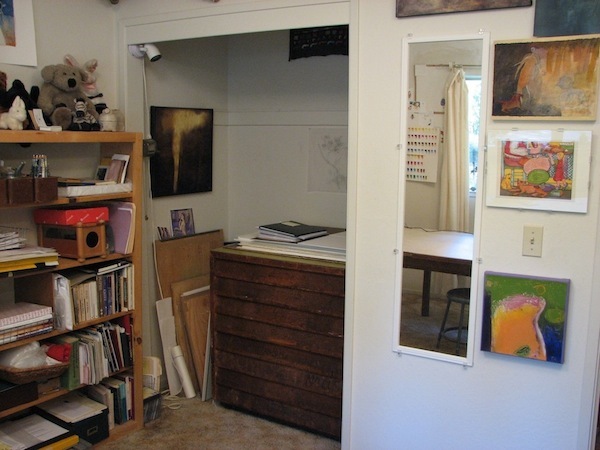 They are simultaneously personal, informative and informal… and often there is an exciting peak into the artist’s studio too. 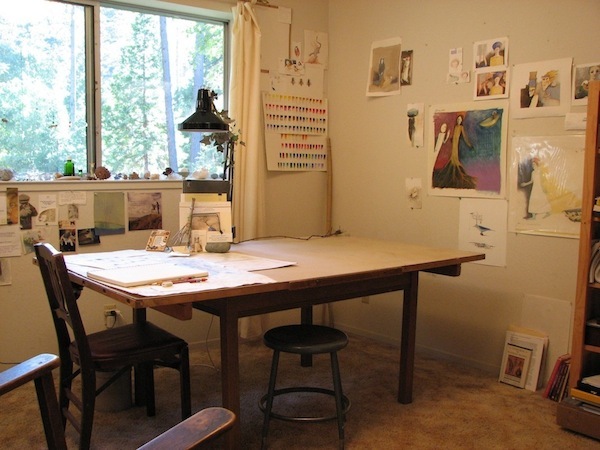 Imagine my surprise when I realized that my own studio does not look so very different from other artist’s/illustrator’s studios! Could it be we are all from the same tribe? 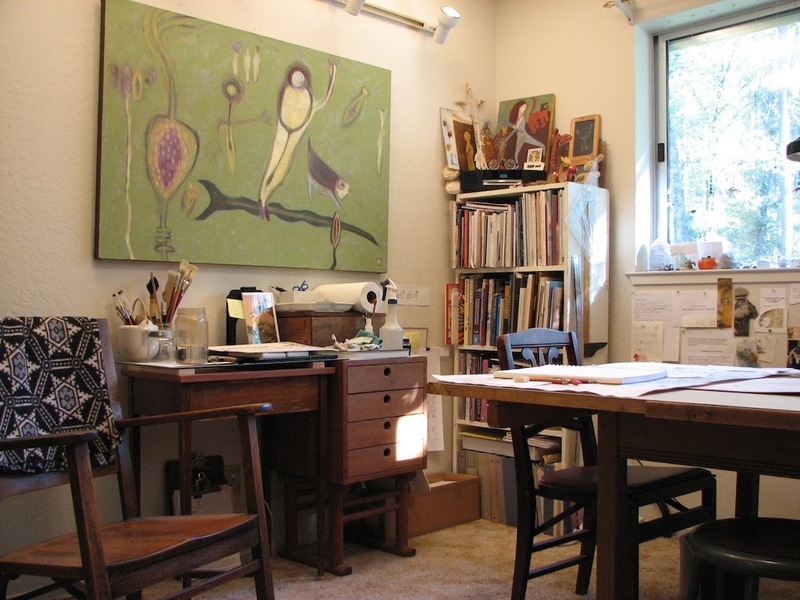 Lots of the pictures we make in the studio can be seen on this blog, and on my website. 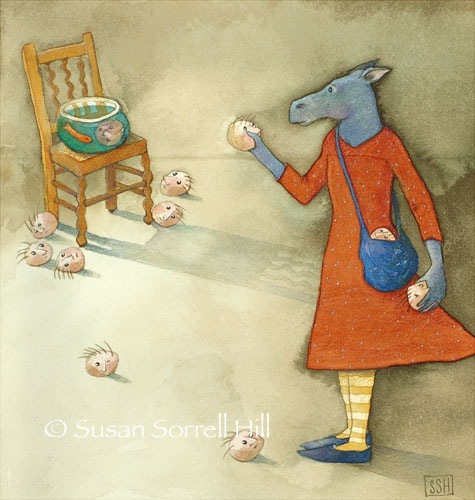 The Illustration Friday word of the week is double. Wizards and avatars aside, most of us cannot be in more than one place at a time, and virtually none of us will live forever. As a result of these limitations, life in a human body will be mostly about making choices. 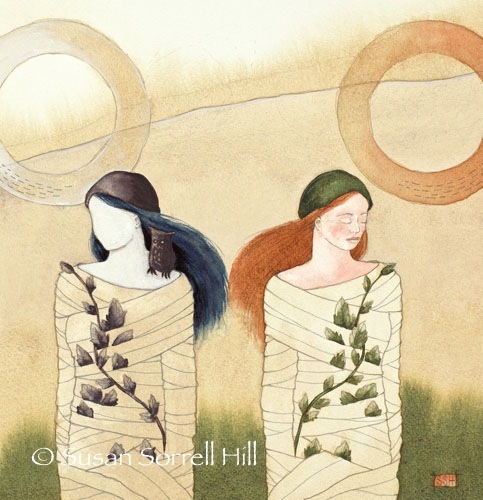 It is an archetypal situation that pairs, or doubles, the seeming contraries of Joy and Grief. No matter how joyful it can be to choose something, inherent in every choice will be the other thing(s) not chosen… the other man, the other career, the other road… the other dinner entrée. It is the classic bitter-sweet experience… and one that becomes more pronounced as one’s years accumulate and death approaches. Perhaps humans have evolved beliefs in things like reincarnation and a heaven to compensate for the sense of things missed? Swiss psychologist, Carl Jung (1875-1961), popularized the archetype of the puer aeternus, the eternal boy (or puella, girl), but it is a truth that has been around far longer than the recording of myth. The Puer embodies the very human resistance to the necessity of making choices in life, and the resistance to the limitations that are invariably part of those choices. The Puer in us wants to have it all… and with no consequences whatsoever! It is a stance on life that is not workable in the long-term. And it is a stance on life that cheats the Soul out of its learning experiences. The fear of making choices, popularized by the well-worn phrase, “Fear of Committment,” over-emphasizes the loss inherent in choice-making, and usually fails to take into account the joy of making a choice… a choice which naturally leads to more choices and more choices again, as a tree branches out from its trunk. To make a choice is not a dead-end. It is only the next step, the beginning of something new. ‘Choosing from the heart’ does require a healthy amount of faith and wisdom…faith that there will be no wrong choices… only lessons and more lessons… and the joy (and grief) of choosing once again. The Illustration Friday word of the week is breakfast. For those of you scratching heads out there, a Green Smoothie is a blended drink consisting of the fruit(s) of your choice (bananas, berries, apples, dates, mangos, papaya, melon, etc.) with the green(s) of your choice (kale, spinach, chard, parsley, lettuce, celery, etc.). I know it sounds strange, and you probably grew up thinking that fruits and vegetables don’t mix, but recent research by Victoria Boutenko and others concludes that greens are a separate category (not vegetables, per se)… and that they combine very well with fruit, both taste-wise and nutrition-wise. If you are at all inclined to experimenting or getting healthier, Green Smoothies are an easy way to incorporate more chlorophyl and minerals into your diet… and they taste delicious! They will even keep in the refrigerator for more than a day. Victoria’s excellent new book, Green Smoothie Revolution: A Radical Leap Towards Natural Health has several hundred blended smoothie recipes (although you’ll probably be inventing your own favorites in no time) and a good overview of her research and her family’s experiences. I still crave leisurely breakfasts of coffee, toast, potatoes and omelets sometimes, and I do hope to enjoy of few more of those in my life… it’s mostly the ritual of the experience, I suspect… but Green Smoothies have turned out to be an excellent way to start my day: not too heavy, not too light, satisfying and energizing to get me through until lunch… which has sometimes also been a Green Smoothie. Ok, so now I’ve come out of the closet: not only am I an artist who loves fairy tales… I am a California health-food type girl. Mostly my approach to food is not dogmatic so much as practical… what works for my body, what keeps me going without bogging me down, what is the least processed and closest to its natural form… and can I get it organic too? Perhaps it does sound a bit fanatical, but in practice, I have become much more calm and focused… and how can that be a bad thing?? Here’s our basic Green Smoothie recipe: 2-3 bananas, 2-3 dates (pitted), 1 apple, 1 large handfull of dino kale or baby spinach and water or cold herb tea. Blend the fruits a bit first with some liquid, add more liquid and then the greens. Blend everything until it’s pretty smooth. Don’t add supplements, powders or other juices: you won’t miss them. Enjoy!! For all you ‘foodies’ out there, Wikipedia has a very in-depth and fascinating look at breakfasts all over the world. Read it here. The Illustration Friday word of the week is diary. I have never been a girl who kept one of those mysterious, locked tomes called diaries. And as much as I am fascinated by dreams, I rarely write them down. I do think about things a lot, but the writing down seems, um, too slow… ? So it was with great surprise that I recently realized that this creature called My Blog has taken on a life of its own, becoming a repository for thoughts and impressions… not just a place to post an image, as first intended. And I am surprised that I am enjoying it… not so different from a diary, really. 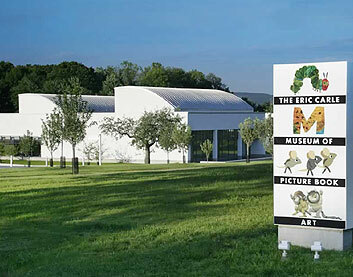 The Museum sits in the middle of the lush New England countryside, quietly echoing large traditional barns and silos with its contemporary architecture which is also reminiscent of Eric Carle’s illustration… bold, balanced, inviting, simple yet monumental. Beautiful stone paving leads to heavy plate-glass doors opening onto the wide, light and airy Great Hall from which the large Auditorium, Art Studio, Shop, Library, Cafe and three galleries branch off. During the Members event on opening night, a grand piano in the Great Hall entertained browsing guests who sipped wine and nibbled appetizers. 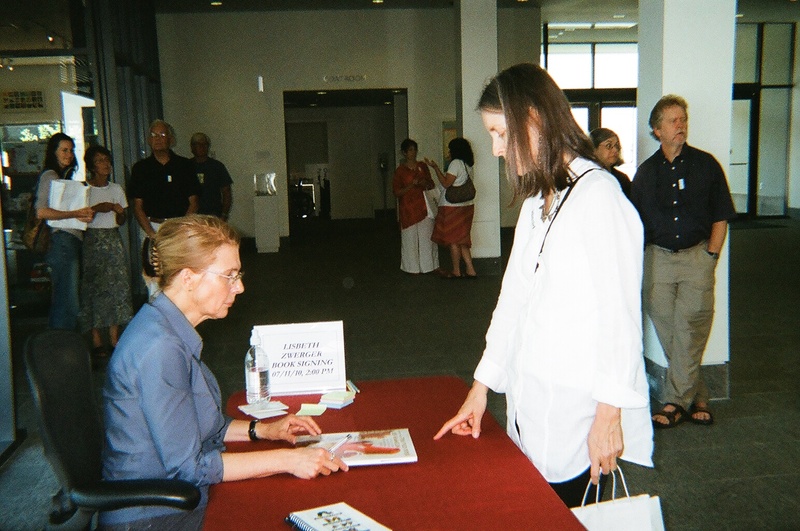 The Hall is also where a very long line of admirers stood patiently waiting to have their book(s) signed by Lisbeth. It would be hard to say too many nice things about the Museum… it is an inspired, well-planned and holistic peek into the world of the picture book. From the extensive Library where children of all ages can browse published books in a cosy setting… to the well-stocked Shop which specializes in award-winning picture books, as well as cards and wonderful gift items… to the Cafe with its healthy snacks (Animal Crackers!!) and friendly welcome to guests who bring their own picnics… to the Auditorium which hosts prominent guest speakers, films, and performances of various sorts all related to the picture book… and finally to the three gorgeous galleries themselves. The galleries are surely the heart of the Eric Carle Museum… one could easily imagine oneself to be in a wing of the Metropolitan. 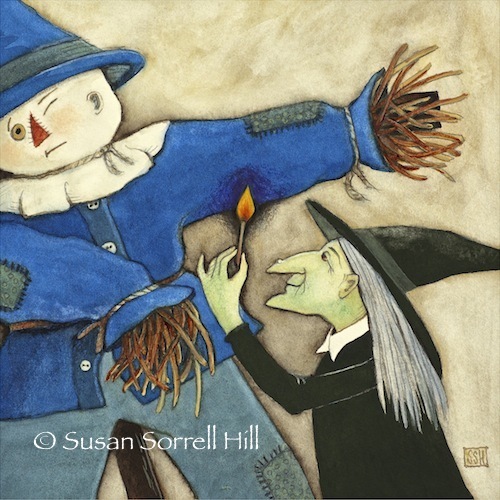 The work is beautifully matted, framed and hung, the lights are kept low to protect the longevity of the artwork, and there is plenty of information given about each illustration, including copies of the artists’ published books to browse through. 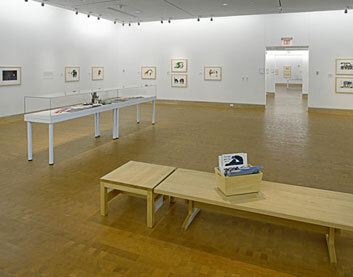 The three galleries rotate shows featuring the Museum’s own collection of Eric Carle’s prolific and endearing work, as well as the works of other notable artists (Leo Leoni‘s illustration for his book, Geraldine, the Music Mouse is on view in The Central Gallery.). 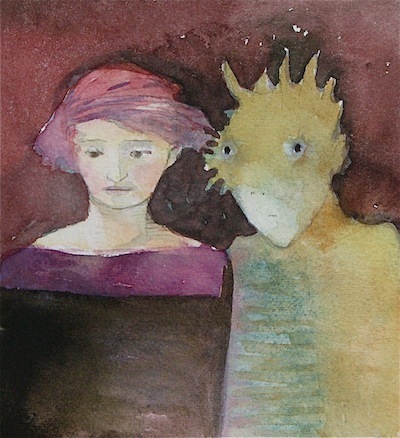 An Exquisite Vision: the Art of Lisbeth Zwerger will be showing in The East Gallery until September 26th, 2010. 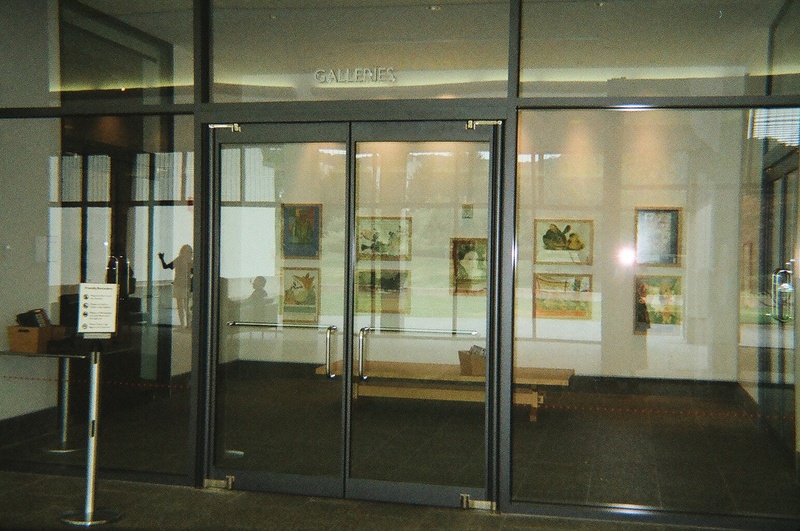 Photographs are not allowed within the galleries to protect the illustrations, but below is a view from the lobby looking through glass doors to the gallery entrances and a view of the West Gallery from the Museum’s website. Entrance to the gallery wings. Viewing Lisbeth’s exhibition, I was reminded of another artist’s comment recalling the first time she saw Lisbeth’s illustration years ago: “I think I stopped breathing for a moment.” It was much the same experience, walking into a gallery where approximately eighty-five original watercolor paintings hung one after another in their overwhelming, delicate and masterful glory. The paintings themselves spanned the full range of Lisbeth’s illustration career… from early, unpublished work to several from her newest book, The Pied Piper of Hamelin, (available in English from Amazon.com in October, unless you happened to be one of the lucky few who got one this last weekend at the exhibit). 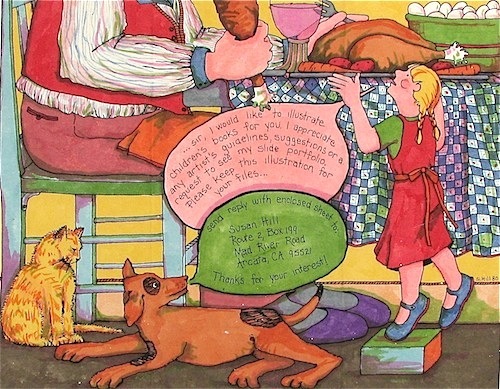 The paintings selected by Lisbeth and the Museum’s Curator represent virtually all of her thirty-plus books in print, and although there has been a definite shift in style, Lisbeth’s brilliant illustrative approach and virtuoso technique is consistently apparent throughout. It is hard not to be slack-jawed with awe. 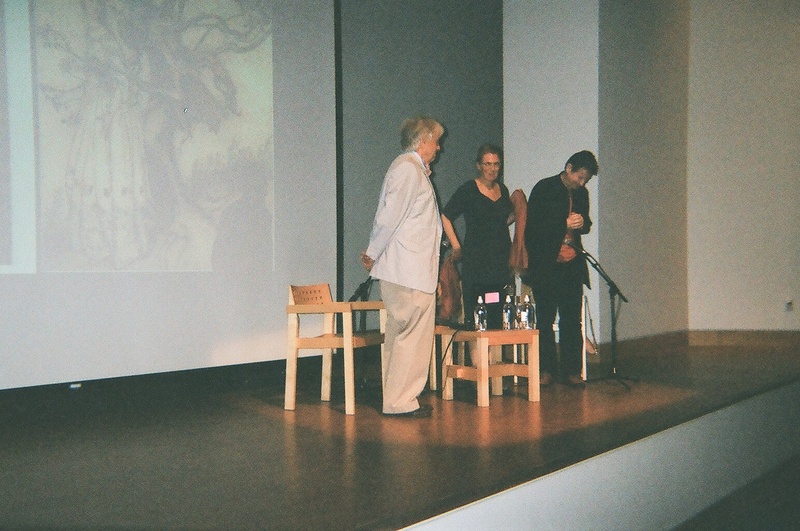 The Museum's Curator, Lisbeth Zwerger and her publisher, Michael Neugebauer... Arthur Rackham on the screen. Perhaps the highlight of the evening was the surprise announcement made by Zwerger’s publisher, Michael Neugebauer (Minedition). Keeping just a few favorites, he will donate his large personal collection of Lisbeth Zwerger originals to the Museum. Having just flown in from the printer in China with a suitcase full of hot-off-the-press exhibition catalogs and Pied Pipers, he looked tired but pleased to be offering his magnanimous gift. Several hundred people came Saturday evening and again on Sunday to hear Lisbeth speak.The Member’s evening was also attended by a number of well-known names in the children’s literature world… among them were Etienne Delessert (who will have an exhibition at the Museum next year, February 8 – June 5, 2011), Leonard S. Marcus, Maria Tatar, and Jerry Pinkney. 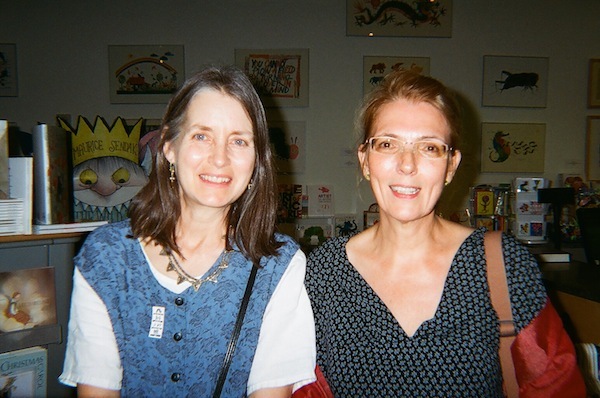 On Sunday, I also had the pleasure of meeting illustrator Barbara Lehman. It’s time for the quiz! Question: Where can you see a bunny hopping by green, green hedges next to a world-class contemporary art museum, make some fun art, purchase award-winning picture books, get a tatoo of “The Hungry Caterpillar,” eat Animal Crackers, meet well-known illustrators, and see beautiful, delightful and memorable original children’s book illustration… all in one day? 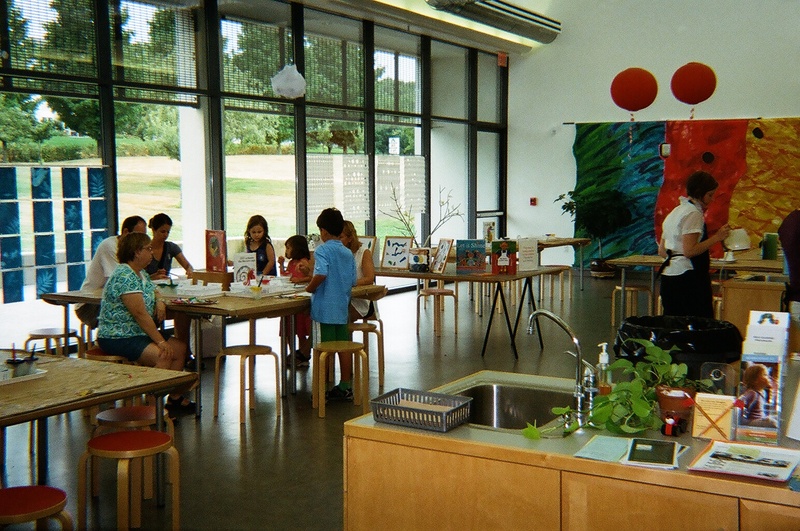 Answer: The Eric Carle Museum Picture Book of Art in Amherst, Massachusetts. For a wonderful Virtual Tour of the Museum, click here. 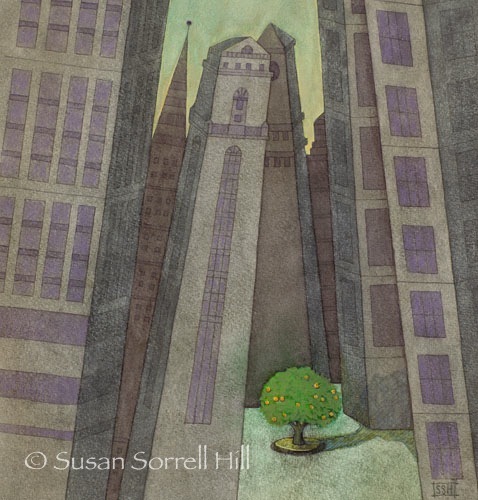 The Illustration Friday word of the week is giant. In 1979, I was an art student at Humboldt State University (Arcata, California), majoring in graphic design and printmaking. Being a college town, Arcata was full of not only great restaurants and cafes, but also one of my favorite things: used book stores. One foggy day, I chanced upon a used copy of Cricket Magazine, featuring the work of the Austrian picture book illustrator, Lisbeth Zwerger. 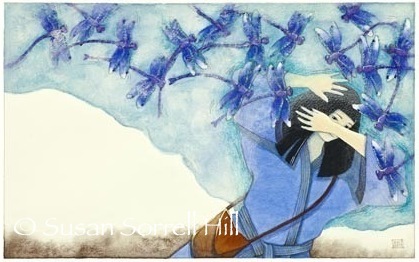 I was awstruck… and suddenly realized that I, too, saw the world through an illustrator’s eyes. Shortly after, I put together a small portfolio and made the ‘inquiry letter’ image that you see above. I must have sent out a dozen or so inquiries, all containing this hand-painted xerox. 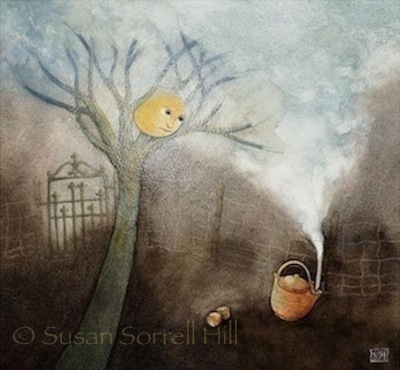 As is typical in the publishing world, most of my inquiries came to nothing, but there were a few kind editors who replied with encouraging words, watering the seed of my dream of being an illustrator of books. I am not sure what happened, but suffice to say that Life swept me away from that dream (with work, relationships, home, garden, and other forms of art), and it has been only in the last several years (which are now almost thirty years later) that I realize that the seed planted by seeing Lisbeth Zwerger’s work is still alive and well… and is ready to come to fruit now. I could, of course, look back at the intervening thirty years and think that I had wasted by time, but it is very clear to me that all of the ‘water under my bridge’ has lead directly to the timing of this fruition. Life is funny, isn’t it? So it was with great joy that I recently received a small loan from friends to visit the Eric Carle Museum of Picture Book Art in Amherst, Massachusetts next weekend (which just by itself is an amazing place) to see the exhibition “An Exquisite Vision: the Art of Lisbeth Zwerger.” Lisbeth herself will open the exhibition with a talk and slideshow, and I will finally have the opportunity to see quite a lot of her paintings in their original form. 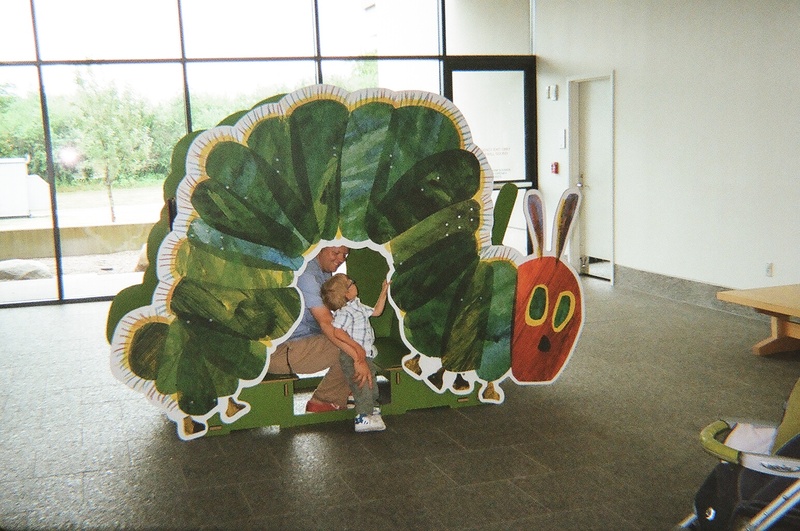 See you next week with a post about my adventure at The Eric Carle Museum! The Illustration Friday’s word of the week for June 11, 2010 was ripple, suggested by Kelly Light. As of the first of July, over 700 artists have donated artworks to the Ripple Blog, started by Kelly in response to the Gulf oil spill. Please read below for details on how you can participate either by donating artwork or making a contribution to an organization involved in the animal rescue efforts. “It’s hard to make ripples in oil soaked water. But throw enough stones and you will! It’s not about the politics or the corporation. It’s about the animals. It’s about not feeling helpless in the face of an overwhelming disaster. We’re illustrators. 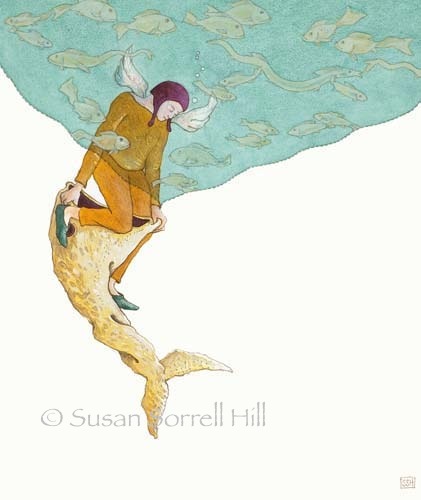 We don’t lose touch with that kid inside who marvels at the creatures who swim below and fly above the sea. We draw them. We are inspired by them. We need to help them. The Ripple Blog was started on the 45th day of the Deepwater Horizon Catastrophe. The oil spill in the Gulf is now over 50 days old with no sign of stopping. We may be too small as individuals to do some grand gesture- but together our small gestures can be grand. This week’s Illustration Friday topic is “Ripple,” and I ask you to consider creating your work this week as a small 2.5″ x 3.5″ sketchcard. The subject should pertain somehow to the Gulf – the oil spill – the oceans and the creatures that live in it and around it. The cards can be submitted to ripplesketches@verizon.net as a jpeg along with your links and a few sentences about you (ie: where you live, etc). Happy drawing for a cause! This sad fish above is my very small contribution to the Ripple project. Kelly notes that $10.00 buys three bottles of dish detergent, which cleans one bird. As of June 22, this project had raised over $5,000 in contributions. If you would like to make a contribution (and receive a great piece of art too), visit the Ripple Blog for more information. 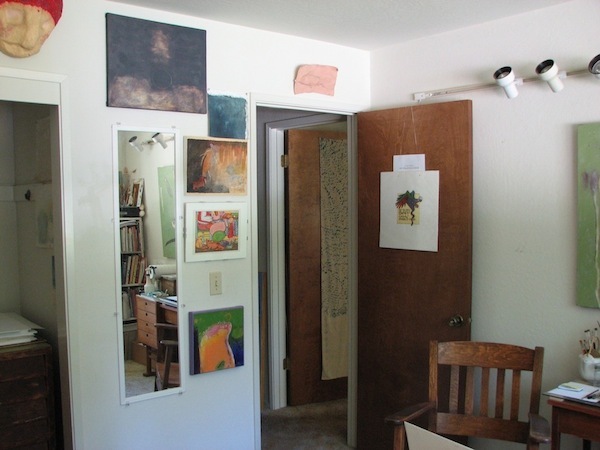 If you are an artist wanting to join this worthy project, visit the Ripple Blog for inspiration and more instructions.